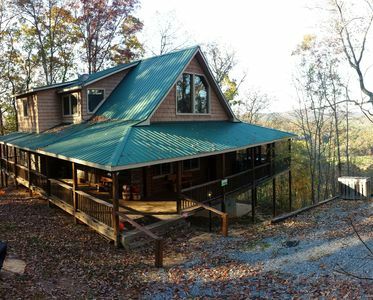 The perfect cabin for the empty nester, couples getaway, girls retreat or family vacation! 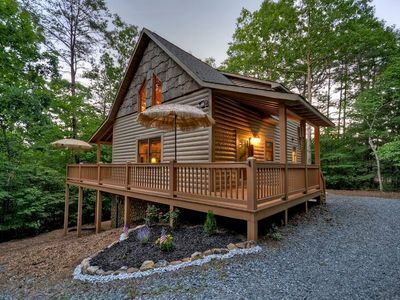 This lovely, single story home has everything you need for up to 4 guests. 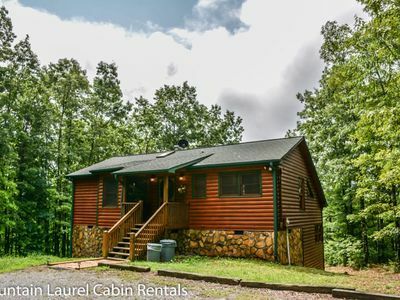 Enter into this wonderful NO STAIRS cabin to an open living area with a beautiful stone-wood burning fireplace, fully equipped kitchen, dining for 4, two bedrooms and a full bath. 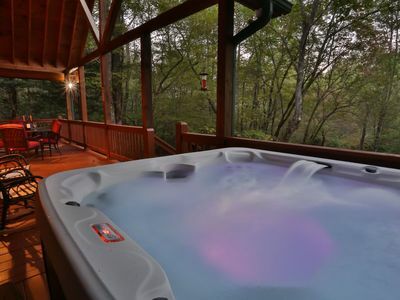 Come on in, sit and relax while listening to the sounds of nature and the squirrels dropping acorns on the metal roof. 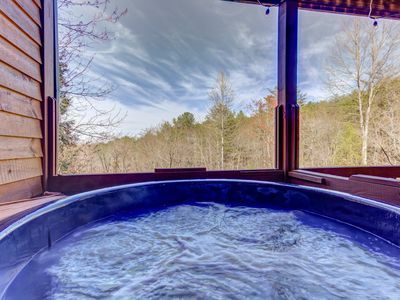 Thoroughly charming, book now and begin making great memories. 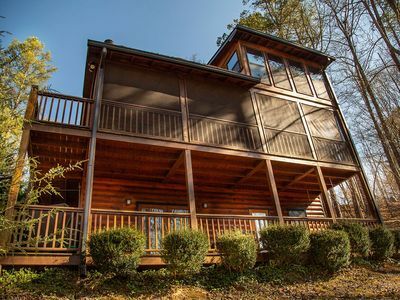 Set in the woods, you will love the spacious covered porch with plenty of seating, a dining table that seats 4 and a Hot Tub that jets out into the woods for a Special Experience in the woods. 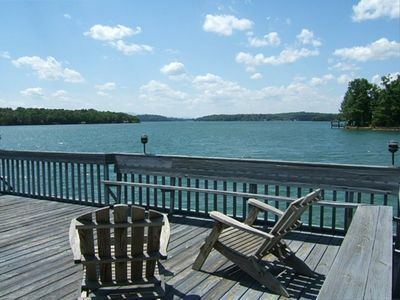 Meander down the hill to a fabulous dock over Cherry Lake where you can fish and dream the day away. 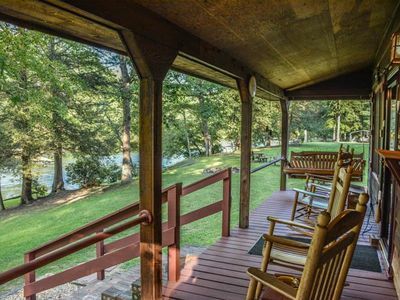 The outdoor porch has a ramp for wheel chair access to the home and there is a power leather recliner in the living room. 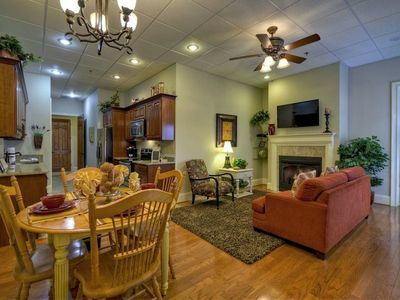 There are two bedrooms in the home, one with a King bed and one with a Queen bed, both bedrooms have TV’s. The bathroom in the home has a tub/shower combo with safety rails. 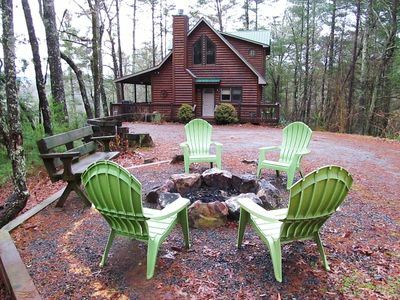 Offering all the amenities of home, WiFi, Cable TV, Blue Ray DVD Player, Dishwasher and Washer/Dryer this is the best home away from home. 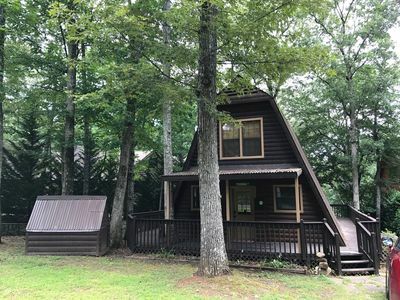 Located just minutes from the quaint mountain cities of Blue Ridge GA and Ellijay, GA, this is a GREAT location for those who want to visit the local antique shops and events happening in the area. 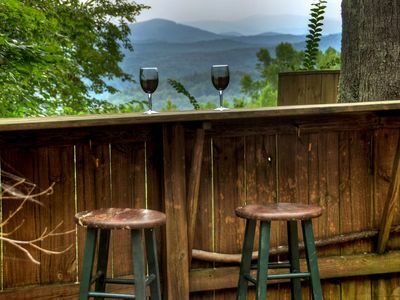 The outdoor activities are endless in the north Georgia mountains where Boating, Hiking, Kayaking, Tubing, White Water Rafting, Paddle Boarding, Horseback Riding, and Zip-lining are all right at your fingertips. 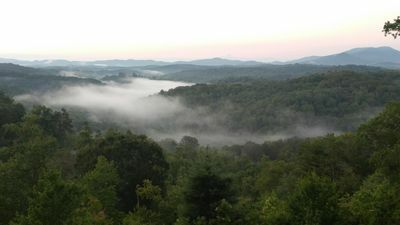 You can also visit the Waterfalls, Hike to a Swinging Bridge, or take a more relaxed approach and enjoy a great meal at one of the many wonderful restaurants located in downtown Blue Ridge or Ellijay, GA. Don’t forget to take a ride on the Blue Ridge Scenic Railway, be entertained at the Big Foot Museum or step back in time at the local Swan Drive-in Theater. Of course a trip to Mercier Orchards is a must. 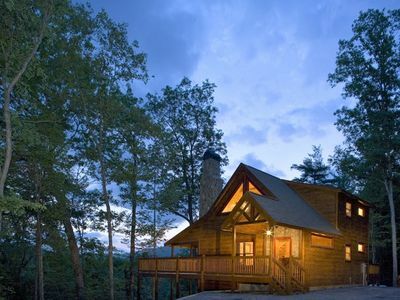 There is something for everyone in the mountains! 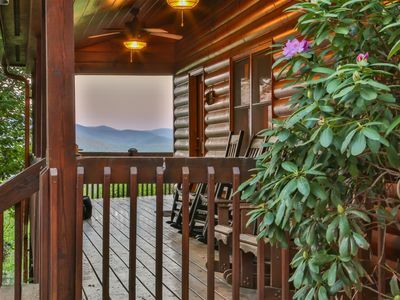 Cozy Log Cabin Off Aska Road Minutes from Downtown Blue Ridge! 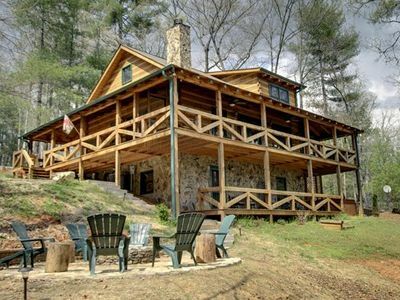 Perfect Getaway *Lots 2 Do! 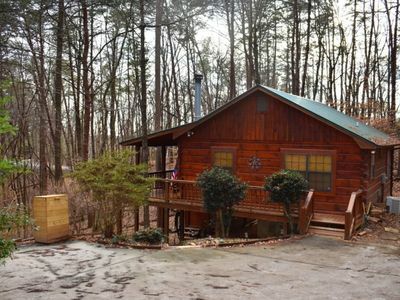 * Fun Upscale Cabin & Great Nightly Rate! 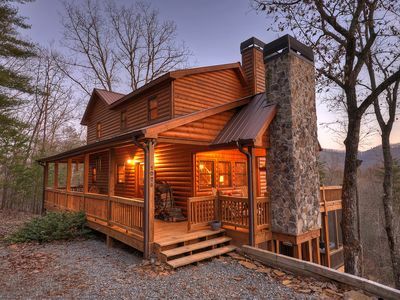 Real Mountain Living!! 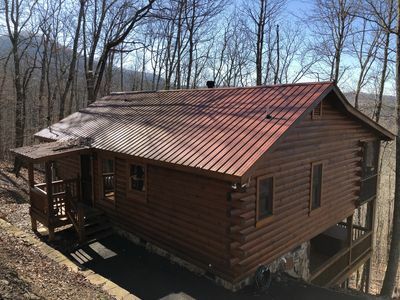 3 bedroom, 3 bath, sleeps , Mountain View! 75" TV! 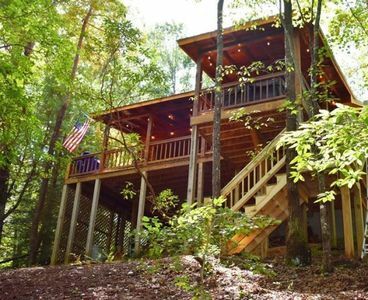 LESS THAN 15 MINS FROM DOWNTOWN BLUE RIDGE! 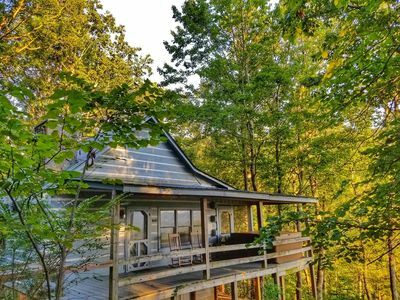 At Brown Bear Bungalow, enjoy the dreamy sunsets over the Cohutta Wilderness. Pet-friendly.